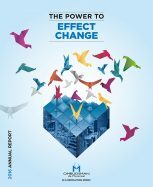 The 14th Annual Report of the OMBUDSMAN de MONTRÉAL (OdM) entitled “The Power to Effect Change” confirms once again the value of this free, impartial and confidential resource which helps citizens resolve their differences with the City or better understand the basis of its decisions. “This 14th Annual Report underscores the importance of our role and the added value of our inquiries, for both the citizens and the municipal administration. Our interventions have a significant impact on the quality of municipal services and the fairness of the City decisions, thereby increasing the citizens’ trust in their municipal government,” states the Montréal Ombudsman, Ms. Johanne Savard. 2016 was another record year. The OdM handled a total of 1,996 files (101 more than in 2015), including 1,903 new requests (172 more than in 2015). Over and above the 89 investigations already underway, the office started 203 new inquiries (43 more than in 2015), for a total of 292 investigations processed in 2016: 69 of the new investigations involved the Montréal Charter of Rights and Responsibilities. “Not only do we handle more and more files, the issues we examine are of greater complexity and variety. Our interventions often result in correcting errors and improving processes; some also have a direct financial impact,” adds Ms. Savard. Cancellation of an invoice of approximately $36,000 for property transfer taxes, following a formal Recommendation. Cancellation of a $1,350 invoice for the storage of a stolen/recovered vehicle, during a police investigation. Reimbursement of $2,850 – fees for occupying the public domain had been charged to a citizen who has to cross the public domain to access his garage. Three-year water tax refund ($385) and commitment that the water tax will no longer be billed – the building is not and never will be served by the municipal water and sewer system. A Borough’s decision not to offer municipal waste collection services to a new residential complex was reversed. Immediate repairs of stretches of streets in very poor condition and subsequent repavement of these roads. A Borough withdrew its threat to demolish a house under construction. The Ombudsman’s role and mandate do not include overseeing or commenting political decisions; the office can nevertheless intervene to prevent implementation problems, thus limiting the number of future complaints. The new 2016 rules regarding Pitbull type dogs generated many reactions. The OdM promptly intervened to improve the City’s information provided to dog owners and clarify ambiguous or erroneous data that was circulating: it published valid information on its blog and ensured that 311 agents, responsible for informing citizens, had a better understanding of the new rules. This OdM intervention is still underway. In November 2016, the Ombudsman read a newspaper article stating that parking tickets had been issued along a bicycle path whereas it was not clear whether or not this path had been closed for the winter. The OdM acted immediately, even before receiving complaints. It checked the facts, analyzed the file and then informed the relevant officials that these tickets appeared unjustified. In December 2016, the City canceled close to 250 of such tickets which had been contested. The OdM is pursuing its interventions to ensure that the remaining 100 or so citizens who received similar tickets but had already paid them are also reimbursed. From year to year, the most common topics of complaints remain essentially the same: Permits (69); Functioning of the Montréal Municipal Court (66); Quality of services (65); Parking violations (59); Social housing/HLM/housing subsidy (57); Animals (56); Application of a municipal Bylaw (53); Behaviour of an employee/elected official (53); Roads/public works (53); Labour relations (51). As for the new investigations opened in 2016, they were mainly related to the following matters: Withdrawal of tickets (23); Social housing (12); Quality of services (12); Animals (11); Trees (11); Roads/Public works (10); Permits (9); Zoning/Town planning/Waiver (9); Application of Bylaws (8); Lanes (8). The Boroughs most frequently challenged in 2016 were: Rosemont–La Petite-Patrie (96 complaints, 28 thorough investigations, 5 summary enquiries); Le Plateau-Mont-Royal (75 complaints, 11 thorough investigations, 3 summary enquiries); Côte-des-Neiges–Notre-Dame-de-Grâce (74 complaints, 13 thorough investigations, 8 summary enquiries); Le Sud-Ouest (62 complaints, 6 thorough investigations, 1 summary enquiry); Mercier–Hochelaga-Maisonneuve (59 complaints, 6 thorough investigations, 1 summary enquiry); Ahuntsic-Cartierville (56 complaints, 7 thorough investigations, 3 summary enquiries). As for Central Departments, the complaints concerned mainly: the Municipal Court (110 complaints, no thorough investigation, 1 summary enquiry); the SPVM Parking Agents (97 complaints, 23 thorough investigations); the SPVM Direction des opérations policières (97 complaints, 2 thorough investigations, 1 summary enquiry); the Direction des affaires civiles (Legal Affairs) (65 complaints, 10 summary enquiries); and Human Resources (44 complaints, no investigation). The Paramunicipal corporations most often targeted by a complaint were: Office municipal d’habitation de Montréal (OMHM) (81 complaints, 7 thorough investigations, 10 summary enquiries); Société de transport de Montréal (STM) (16 complaints, no investigation); Bureau du taxi de Montréal (13 complaints, 2 thorough investigations, 1 summary enquiry); Société d’habitation et de développement de Montréal (SHDM) (10 complaints, 1 thorough investigation); Société en commandite Stationnement de Montréal (5 complaints, no investigation). The OdM also received 29 complaints concerning City Council and 8 concerning the Mayor’s Office: they were mostly to contest the new rules on Pitbull type dogs. The average processing time for new 2016 complaints closed in the same year was 3.29 working days (all files combined). The average processing time for investigation files closed in 2016, regardless of the year in which they were open, was 82.51 working days. On December 31, 2016, 103 investigations were still underway. Created in 2003, the Ombudsman de Montréal office operates with a team of 9 people, including the Ombudsman. It provides a last resort recourse to ensure that citizens’ municipal rights are respected and that their files are handled with respect and fairness by all municipal stakeholders. This service, which is completely free of charge and easily accessible, contributes to more transparency, better municipal services and fair decision-making processes within Ville de Montréal. Over the last 13 years, the office has handled more than 17,000 complaints and conducted nearly 2,700 investigations. The OdM also offers the only available recourse to ensure that the Montréal Charter of Rights and Responsibilities is complied with by municipal managers, employees and elected officials.